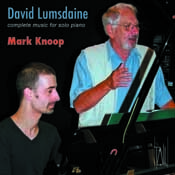 David Lumsdaine’s piano music, as heard on this excellent disc, is rich in technical intricacies. One can take analyses of these constructions on faith, but Lumsdaine’s intellectual approach is apparent as soon as one attempts an initial description of the music: one hears groups of pitches rotating and transforming, melodic and rhythmic contours evolving, the careful control of register and density. (Mark Knoop makes an ideal interpreter, conveying the full range of these subtle interactions without ever crossing into inappropriate histrionics.) This is most apparent in Ruhe sanfte, sanfte ruh’, an extended fantasy on the opening chords of the Bach chorale, which ghost the music’s 20-minute span, gently pushing open a window into the unfolding of Lumsdaine’s technique. In the opening section of Kelly Ground, one can hear that the (serial) pitch organisation is arranged to determine that similar pitch collections tend to cluster together. There is also a restricted gamut of gestural possibilities: predominant is a two-note ‘spring’ upwards, like a rabbit hop. Such factors – similar examples can be found throughout this CD – contrive to give Lumsdaine’s music a certain consistency of grain, out of which emerges a sustained expressive character. Thus, although the music is highly organised, there is never a sense of contrived abstraction. In Kelly Ground, the overwhelming mood is a sombre one of energies and freedoms restrained. This suppression is deliberate, of course, a compositional attempt to tame an infinite and anarchic field of possibilities. Over the course of the piece’s six sections, from Ned Kelly’s awakening on the morning of his execution to his eventual hanging, the musical shackles are slowly released, but the music loses cohesion and purpose. In the final section, the hanging itself, the sprung figures from the opening return to more morbid effect in slower rhythm and with portentous bass undertones, swinging like bells or a body. With Kelly’s death, the fizzing energy of the earlier movements has become petrified, the musical tension lying in the relative merits of various degrees of control and freedom. In the late 1970s, Lumsdaine began making field recordings of Australian wildlife and landscapes. In his excellent sleevenote, Michael Hooper writes of Lumsdaine’s self-imposed rules for producing and editing such recordings, to do with fidelity to the diurnal cycle, to location and to season. In one technique, several recordings would be made in a single location, but with the microphones pointing in different directions each time, thus capturing in sound a sense of perspective and the spatial interrelationship of the landscape and its inhabitants. It is this process of objective observance within a sparsely occupied three-dimensional space that is the subject and effect of the piano piece Cambewarra. Whether there are birdsongs here or not (and this isn’t sub-Messiaen exercise in transcription) doesn’t matter: one hears musical objects simply presented and organised in contrasting temporal and spatial relation to one another. It is the way that the understanding of one’s environment is structured through phenomenal experience that is captured, more than the local details of that environment. As with Kelly Ground, in Cambewarra Lumsdaine again approaches programmatic content, whilst avoiding the temptations of crude mimesis. An Australian landscape and a national hero. One is tempted to uncover an underlying nationalism, but to do so would be to miss the point. Despite his titles, Lumsdaine doesn’t deal in musical representations – or at least, not in any straightforward, unmediated way. He avoids parochialism by unearthing from such stories and locations structures that speak to universal experience: the tensions between freedom and a determined society, the sensation of open space and one’s own environment. It is such steadfast belief in the power of technical abstraction to articulate human concerns that gives Lumsdaine’s music its profound beauty.